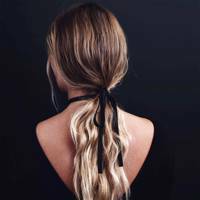 There are two types of ponytail - the essential, basic, keep-that-hair-outta-yer-face sort of pony, or the powerful, statement sort that demands attention and deserves a swing! We're here for the latter. It's no secret how popular this head-topping style has become, with stars like Ariana Grande showing us that the bigger, longer and *ahem* shinier it is, the better. 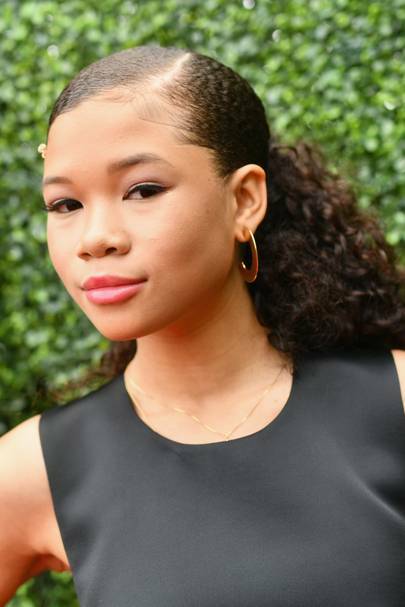 Even those with short hair can get in on the action, with the low, parted pony offering an on-trend option for anyone rocking a bob or lob. 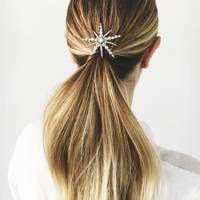 The key is to keep it interesting - whether embellished with hair accessories, twisted, braided, or just incredibly sleek, these little details will take your ponytail game up a notch and stop it from slipping into schoolgirl territory. But before that, be sure to style prep. 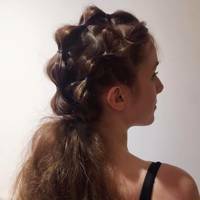 To create all the volume and bounce you need, spritz in some dry shampoo or texturising spray pre-styling or even add in a few curls with a curling wand before putting it up. 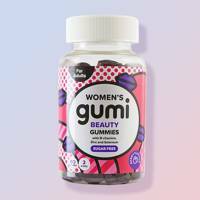 This will especially help thin hair to hold the hairstyle in place. 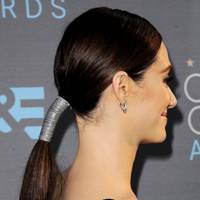 Skyscraper high, with a feminine flick at the end, Miley Cyrus' pretty ponytail blends two trends. 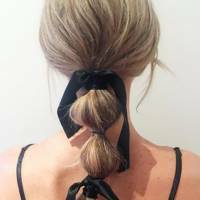 Bind low ponytails with ribbons, cuffs or even leather to give the style an edge. 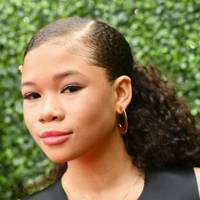 Storm Reid absolutely killed it with her ponytail at the MTV Movie Awards. Business in the front with a slick side part; party in the back with bountiful natural curls. 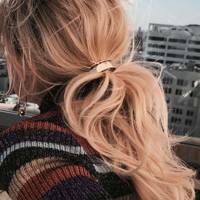 Velvet is having a moment RN, so grab a scrunchie and get in the game by tying it around a textured pony. Blonde hair + black = chic. 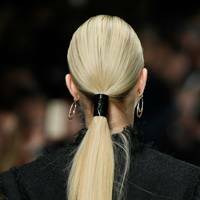 Add a few extra hair ties, a couple of chic black ribbons and voilá, you've got a red carpet-worthy ponytail. 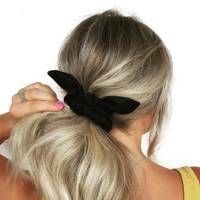 A simple, standout hair accessory placed just above the ponytail will give your look a sophisticated, dressed-up edge. Who said a ponytail has to fall straight? Dare to invent. It might make for a totally new chic look. *Ponytail* as old as time... Belle knew it best, a low pony is always the cutest, pair it with a twisted side for the ultimate look. Curling your hair and backcombing slightly to add some texture will give your style extra volume. 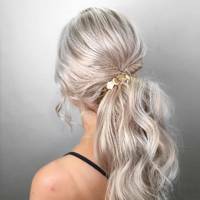 Secure the pony with a metallic band. "@juleshough: "let's do a pony...............". Me: "ok.... " In my head: "how can I do a pony different than the 187 other ponys we have done in the past?" ...................... <15 minutes later of experimenting> that's how." The experimenting certainly paid off! 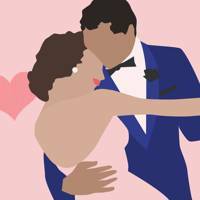 This style is particularly clever. 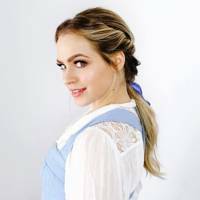 Riawna Capri showed you can totally wear a ponytail with a fishtail braid at the same time. 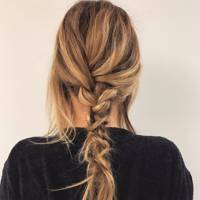 Add in some subtle braided twists and cool texture with this woven style. 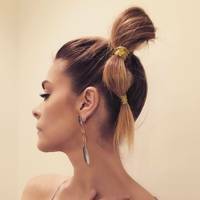 Hairstylist Sascha Breuer created this killer pony on the stunning Jaime King. 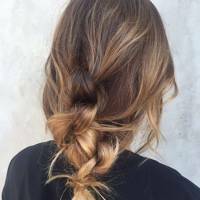 This is perfect if you're looking to add a little more structure into your hairstyle. A few twists and turns can turn a simple pony into a cool hybrid plait/pony updo. 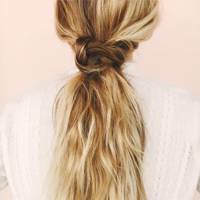 This is one of the simplest, yet chicest ways to amp up your ponytail. 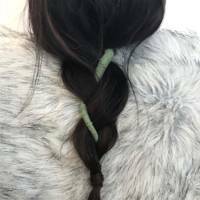 Simply braid a section of the hair and wrap it around your hairband. Another plait-meets-pony style, yet a little fiddlier. 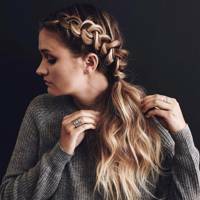 Enlist the help of a braid expert with this one! Even the least experienced of us can have a go at this cute, sleek wrap-around look. 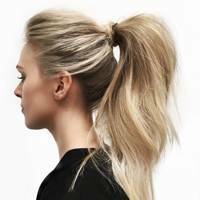 This is a simply stunning way to give your ponytail an edge. 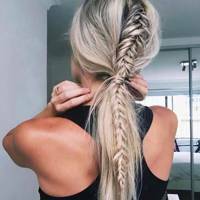 Braid the top part of your hair before tying it all together in a wavy pony. When it comes to twisted looks such as this one, the messier, the better! 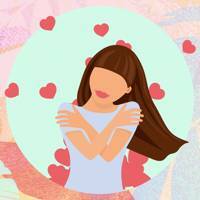 Pull out bits of hair at the front to give it an extra air of nonchalance. We adore this sleek style, complete with fabric details. 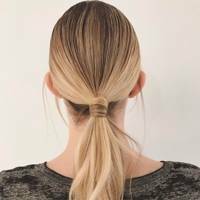 Wear it high and wear it proud with a pared-down wrapped pony. Stylist Kristin Ess always wows us with her styles. This messy bun-meets-low-pony is a particular fave. 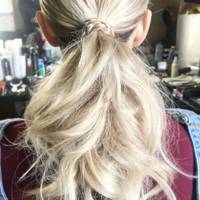 We can't get enough of this youthful, fun take on the humble ponytail. If simple styling is more your thing, simply wrap a ribbon around the top of your style to secure. So stylish. 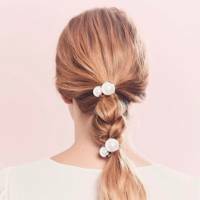 Adorned hair ties on a low braided pony, for a super romantic look. Add some umph to your ponytail with volume powder and tousled beach wave curls. 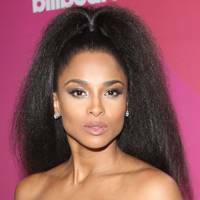 How stunning did Ciara look at the Billboard Women in Music ceremony? This is what we call a sassy ponytail! Elsa Hosk is a big fan of updos, and this pony might be one the best things we've seen from her in a while. after Kim Kardashian and Hailey Baldwin joined the list of celebs trying to reinstate the 90s trend. 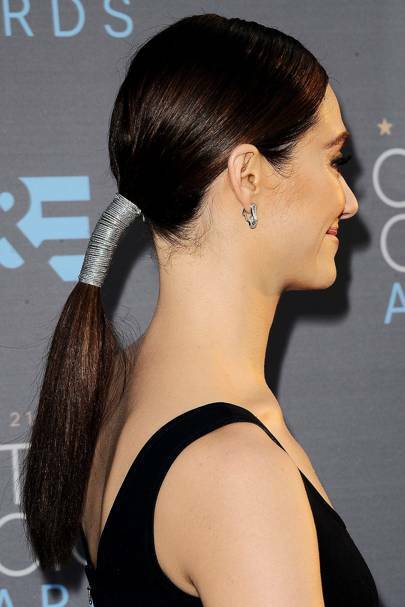 Wow, that's one way to wear a ponytail, Emmy Rossum! The star gave her sleek style an edge with this wrap-around band. Jessica Chastain looks like a red-headed tomb raider in this exquisitely detailed pony. Somewhere half way between a french plait and a low pony, the complex, auburn twist is mesmerising when set against a white canvas dress.